Leading the way in innovation, design and protection, tech21 today announced the launch of its new and enhanced protective range of cases and screen shields for iPhone 8, iPhone 8 Plus and iPhone X. Using a unique three-layer impact absorption system and its proprietary material, FlexShock™, tech21 cases are designed to protect drop after drop. Each innovative design is subjected to rigorous testing* with cases drop tested 20 times, ensuring durability and long-lasting protection so that users can drop more and care less. 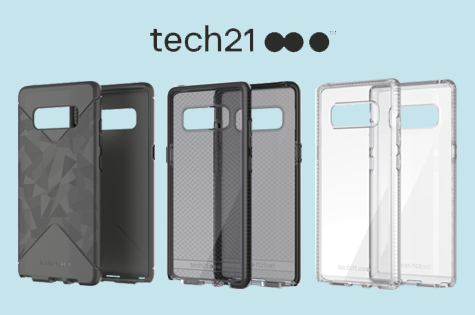 The tech21 range offers market leading impact protection without compromising phone performance. Extensive testing guarantees a perfect fit, no loss in signal quality and no interference to Wi-Fi, mobile networks, Bluetooth syncing or features such as Apple Pay. Core functionality such as camera, acoustics and sensors (such as Touch ID) will work the same with the case on or off. Pure Clear – More Than Skin Deep. With Pure Clear, users can show off iPhone 8, iPhone 8 Plus and iPhone X while still keeping it protected. Thanks to new materials, including BulletShield™, Pure Clear is the most transparent tech21 case ever made, is significantly thinner and lighter than the market leader yet still provides up to two metres of drop protection. Available at JB Hi-Fi, Harvey Norman, Optus, Vodafone and Telstra stores, as well as tech21.com. RRP $49.95. Evo Check Evoke Edition – Protection with an Evocative Twist. With a bold floral design, there’s more to the Evoke Edition than meets the eye. Sitting beneath the seductive surface is an effective three-layer protection system which spreads out and absorbs impact energy, offering three metres of drop protection. Available in Pink/Red and Clear/Blue at tech21.com. RRP $64.95. Evo Wallet – Access Everything. Comfortably. With two concealed card slots in its folio cover to keep cards secure and easily accessible, the Evo Wallet is designed for those with busy lifestyles. With FlexShock™, the case also provides up to three metres of drop protection so users can keep their phone protected. Available in black and pink at JB Hi-Fi, The Good Guys, and Harvey Norman, as well as Vodafone, Optus, Virgin and Telstra stores, and tech21.com. RRP $64.95. Evo Check – Subtle Design Detail. Sitting beneath its unique check pattern design is an effective three-layer protection system that includes FlexShock™, an impact material unique to tech21 that provides up to 3 metres of drop protection. Available in Smokey/Black, Clear/White, and Rose Tint/White at tech21.com, JB Hi-Fi, Harvey Norman, and Vodafone, Optus, Virgin and Telstra stores. RRP $49.95. Evo Tactical – Raw, Tactile Feel. Inspired by the raw beauty of minerals, the Evo Tactical case combines durable materials with refined, contrasting textures, giving users a tactile experience every time they pick up their phone. While this makes it easier to grip, tech21 technology ensures that even if dropped, iPhone 8, iPhone 8 Plus and iPhone X will be protected, drop after drop. Available in Black attech21.com, The Good Guys, and Vodafone stores. RRP $49.95. Impact Shield with Self Heal – Advance Protection. Enduring Clarity. Designed with a reflowing polymer surface layer that smooths over day-to-day scratches and featuring BulletShield™ to absorb impact force, Impact Shield Self Heal leaves your screen smooth, crystal clear and highly protected.Available for iPhone 8, iPhone 8 Plus and iPhone X at tech21.com, JB Hi-Fi, and Optus stores. RRP $39.95. Impact Shield with Anti-Glare – Perfect Clarity in Direct Sunlight. Rather than seeing reflections when viewing content, Impact Shield Anti-Glare uses a surface layer that diffuses and scatters light, allowing users to see the screen with perfect clarity, even in direct sunlight. Available for iPhone 8, iPhone 8 Plus and iPhone X at tech21.com. RRP $39.95. Evo Glass – Smooth and Precise. Thanks to premium tempered glass and precision polishing and etching techniques, Evo Glass adds unrivaled protection to screens, protecting them from anything life throws at them. And at only 4mm thick, users will soon forget that it’s there. Available for iPhone 8, iPhone 8 Plus and iPhone X at tech21.com, JB Hi-Fi, and Optus stores. RRP $49.95. Since 2005, tech21 has been developing the most advanced, scientifically proven cases and screen shields for mobile, tablet and laptop devices worldwide. tech21 combines science, engineering and British design to create products that address three core consumer benefits: style, protection and performance. As the brand evolves to continue meeting the needs of its consumers, tech21 has developed the most advanced impact protection material on the market – FlexShockTM. The ultra- thin and lightweight material absorbs and dissipates force and can withstand drops up to three metres. In addition, tech21 puts all its products through a rigorous testing program, and in an industry first has partnered with the National Physical Laboratory (NPL) to develop its testing methodology. This ensures that the tests tech21 products have to pass are overseen by independent experts. Tech21 is the number one case brand in the UK. For more information, visit tech21.com. * As the national measurement standards laboratory for the UK – and globally recognised as the leader in its field – the National Physical Laboratory (NPL) is at the forefront of testing methodology. Working in partnership with NPL, tech21 has built cutting edge equipment, a unique testing methodology and formed a team of highly skilled scientists – to deliver a more advanced testing proposition in a new R&D facility. Three (3) units of tech21 iPhone cases - winners may choose the range they like. It is good to get this deal because this is the time when you get the working about some thing. And if your working is successful then means the term paper writing services of that thing is the good for us. And it is good to find the best place of these things. Nice article and ring doorbell installation is the greatest!!! He’s educated, pleasant and personable!! Really professional!!! I would recommend him to ANYONE! He was able to conserve my personal mom’s telephone through losing over Three thousand five hundred photos and 380 movies!!! He handled all of us on 2 different days and he really was honest as well as helpful! Thanks again!!!! Well, I think phone covers are very necessary to protect your phone. If you are not super careful then there are more chances that you can also damage your phone. Mobile phone companies can make a phone but you have to protect it from damage.